That's not the real question. Arguments about fish and even economic benefit disguise the real question. The real question is whether the lower Snake River dams stay in place. According to Patagonia's Environmental Campaigns and Advocacy Manager, "Let's specifically take out the four dams on the Lower Snake River . . . This is . . . the holy grail of dam removal. . ."
Ben & Jerry's Ice Cream website adds some icing to that cupcake: "For communities that depend on river ecosystems. . . damming rivers and streams has devastating consequences." To the right is a photo of slack water, created from Lower Granite Dam. You'll note cruise boats in the background and fishing b oats in the foreground. Below are photos from the 1992 test drawdown, which killed fish, ruined marinas, and damaged roads, bridges, and the foundation of river terminals. Let's decide, as a community, which is more devastating. Over the years, the lower Snake River dams have gotten more fish friendly. How friendly, you ask? A 2004 article in the Tribune celebrated the return of 2,400 coho through Lower Granite Dam. In 2014, from Sept 1 - 24, fish counters tabulated 166,820 coho through Lower Granite. In just 25 days. Perhaps you noticed that fishing for this species opened up for the first time in decades? Perhaps you were someone who caught a record size coho this fall? These numbers illustrate that fish and dams can co-exist. Let's presume just for a moment, that the question is about dredging. Some people think that dredging is only about river transportation. That's incorrect. 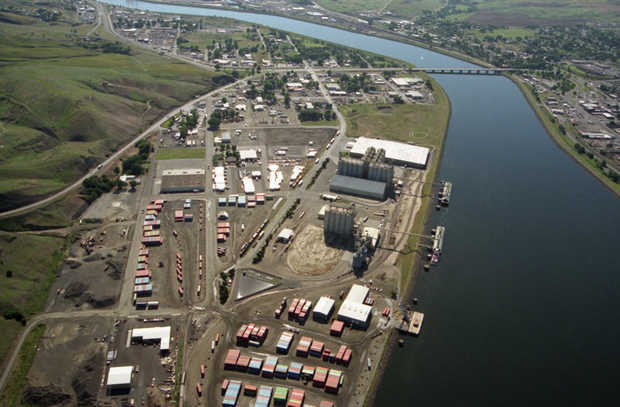 The Port of Clarkston wishes to dredge its recreation dock. Other recreation facilities are challenged by sediment. The U.S. Corps of Engineers has been holding river volumes unusually high, to keep navigation safe. When water goes back to normal, at least two boat launch facilities and both marinas in the valley will have significant sediment challenges. Dams provide irrigation for food crops, transportation for products grown and manufactured in our communities, transportation for tourism, and resources to address challenges with fish (through ratepayers, not taxpayers). They also provide low-cost non-carbon-emitting energy. Do we really want them to disappear -- to be replaced with costly nuclear or coal-fired facilities? Decide for yourselves. Who gets to have a greater mark on our community -- well-intentioned but uninformed corporate outsiders, or you? What will our valley look like if those four dams are removed? We're all in this together. Let's not let Patagonia, Ben & Jerry's, and Earth Justice decide our future.